It’s every employer’s worst nightmare. Whether you notice the hygiene issues yourself (or another employee brings it to your attention), it’s up to you to deal with it… but how? It’s going to be embarrassing for you, it’s going to be even worse for them and you don’t want to leave them feeling self-conscious. Here are some tips for how you can navigate the “stinky” process safely. It’s incredibly important that you take your time in these situations. You should wait until there is a consistent pattern of poor hygiene before you approach them. Running out of deodorant is not a crime, and even the best of us may have sacrificed a shower for a bit more sleep. It’s wise to be prudent in these situations as not to create an issue based on an isolated incident. You also need to consider how you will tackle the conversation. This may require adjusting the conversation based on the temperament of your employee and the relationship that you have with them. Whatever you do, don’t frame the conversation is an accusatory way. Try and approach is as constructive criticism like you would any other issue in the workplace. You are a leader so, deal with the situation head-on. That means you don’t go the passive-aggressive route of leaving deodorant or body spray at their work station. That won’t solve the problem. In fact, it will likely make things much worse. You can deal with this with compassion and kindness, which means you can’t leave a note either. As a leader you have to show courage – you are the role model your employees look to. You don’t want your employee to feel more embarrassed. Find a private place and sit down for a face to face conversation. When you handle issues like this properly it benefits you, the employee in question, and the workplace as a whole. You can offer a bit of understanding, while still remaining firm. Employees respect honesty. If you didn’t notice the issue and it was raised by another member of staff, do not let your employee know this. This will only make them more self-conscious. There are a number of reasons why someone might struggle with hygiene. They could be dealing with anything from underlying health issue, to an ineffective brand of deodorant. Even the material of their clothing could be a contributing factor. There are issues that cause excessive sweating, including anxiety. So, you can come at it from this angle as well, from a place of concern. Additionally, a hygiene problem may be indicative of poor mental health or other issues in their personal life – so that’s a conversation that you should be prepared to handle, but don’t assume this is the case. The initial conversation isn’t enough. You need to follow up with the employee and let them know that you will be doing so. Give them a time-frame of a week or two to make the necessary changes before you sit down again. This allows you to determine whether the issue has been resolved and if it hasn’t been, then you can brainstorm a new strategy. If they have resolved the issue then you should thank them for putting the effort in. Ignoring hygiene issues can come at a cost to your business. 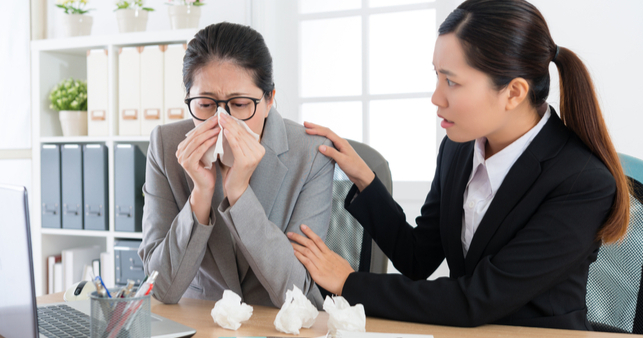 Poor employee hygiene can impact the productivity of their co-workers and reduce overall satisfaction in the workplace. Promoting positive office hygiene (such as clean bathrooms, kitchens and adequate hand-washing supplies) sets a standard for the workplace for employees to follow. It’s also possible to include general hygiene standards such as hand-washing and clean workstations in your employee handbooks. If you need a hand navigating these, or any other delicate HR situations, contact us for an initial chat to learn about how Employsure can support your business.